twisting or slipping. Now available in the Half Waffle and Rogue patterns. Single clamp design secures clutch side grip without causing any irritation to riders palms or causing blisters! Knockout ends easily accomodate handguards. Now available in popular Half-Waffle design. For use with twist throttles. Great grips easy to install. Low cost and look great. Lock on grips are way better than dealing with glue or wiring. These are hands down most comfortable grips I’ve ever used in 25 years plus riding. They are comfortable with out being a pillow. Very good for guys with a larger hand. My first pair of lock on grips - where have these things been all my life! Super easy to install and feel no different than traditional grips, which is a good thing. Great value considering you don't have to fight with grip glue. The grey soft compound grips are amazing. In any conditions they are absolute glue! They hold up way better than expected. They are so soft I thought they would only last a few rides but they have been going strong for about 10 hours now and no signs of letting go yet. I've had these before and they are great. I decided to get some new ones and bark busters. Reading the description it says "Knock out ends" well that's only kinda true. Mine didn't knock out at all. I read the instructions and tried cutting it, then slamming it a few times against the bar and no bueno. Wound up just drilling the end out with a step bit. At the end of the day that's fine but I was looking forward to an easy install and am a little disappointed. Still love em and would still recommend them but if you have bark busters some modification is required. Feels like pine tar holding your hands to the bars. I bought the white half waffle ODI lock ons for my CRF450X. The grips are super grippy and soft. They won’t stay clean but they are by far my favorite grips I’ve ever used. i just got thease grips last week i ordered a soft grey compound as i like soft grips. i was worried about the grips sliding off and slipping but i have done 4 motos and a few hare scrambles and they have not moved a bit! highly reccomed super easy to install as well! Finally went to the lock-on grips and it has been well worth the money. I use wrap-around hand guards and Odi makes it so easy to install with the "pop-out" end cap. Very easy install and great instructions come with them. Have had two other sets and my son who is 11 on a YZ85 loves these grips. My first time using LO grips. I didn't like filing down my handlebars, but other that that these grips are great. No slippage, no wire tying, just tighten, grip and rip. Bought these trips for the ease of installation. Love how easy they install. Way better than dealing with grip glue or safety wire. Easiest grip install. No glue, no safety wire, and no slip! The grips feel great and have been durable so far. These grips are awesome! Super “grippy” diamond half. Really easy to change out grips. No more safety wire or messy glue or cure time. ODI lock on grips are the way to go! Only grips I’ll ever buy! I'll never go back. These make it so easy and they feel great! Easy to install and no glue required. Hold up well. Take Note: I own a 2016 beta 350RR. I needed to order a separate CAM in order to fit my beta. It's a CAM E. Although, rockymountain states it will fit, the packaging does NOT come with this CAM. It needs to be ordered separately. Other than that, it's a great product. Best grips money can buy in my opinion. Comfort & no glue needed! Can’t ask for more. Easy as to replace good instructions on which bike theyll fit on which cam adapter to use couldnt be happier! Easy to instal and you get a new throttle tube every time you put in new grips. Also gives you a chance to clean and inspect throttle assembly and cable while it’s apart. Best grips hands down. Could be a little thicker and softer but work great. Easy to change and glue isn’t required. I've ordered and used these on several different bikes and have never been disappointed. Inexpensive, easy to install, look good, and last as long, if not longer, than a glued grip. Well worth it! The pair I replaced with these had almost 3000 miles on them. Good stuff. Once you get these you will never go back to glue on grips! Had these on for one ride and they have been good so far. The grip material is a little harder than the protaper grips I've been running but they should wear better. The non throttle side grip is tight to put on a protaper bar. I had to sand the bar a little to get it to go on but they have stayed in place so far. Awesome grip, no more throttle grip! How can you beat lock-on grips? Lock on grips are so easy. I don't think I'll ever go back. They can be installed in seconds and uninstalled if you need to do something with your handlebars. They don't slip, and you don't have to use any adhesives on your handlebars. The half waffle is great. Quick and easy. Compound feels nice and soft - - easy on the grip. Lock on tight, no need for glue,,ever. Hold up better then some of the bars on a crash, switch em right on a new set of bars and go, no waiting on glue. This is a great product. No more glue or safety wire. So easy to install and no grip slipping. I think the website needs to say that ODI grips are not compatible with pro tapers, even though I was able to make them work. Still an amazing product! Perfect. I won't be using glue anymore. These are comfortable on long rides and super easy to install. I sold. do yourself a favor and but the 5$ grips. these ripped the first time i rode them. the throttle tube tended to get a lot of dirt and dust in it making a grinding while turning the throttle. I run these on our three bikes and we love them. Very comfortable. Best grips I have ever used. They are all I use now. Super easy to put on and with no messy glue. Won’t ever buy normal grips again. These are the best idea. Love them. Trashed after one ride without even dropping the bike. The grips began to rip around the edges and middle of the grip. Very thin and soft material is used to manufacture these grips. Don’t get me wrong they lock on very well but will not hold up to much. Very dissatisfied with this purchase after a half hour at the track I already needed a new set. Slightly smaller diameter than Torc1. Long lasting and comfortable! The emig v2s can feel a little hard compared to these. Very easy install. I use these on all my bikes! These grips do not fit a 2016 yz250 odi put on the box “Fits most 2 strokes” I’m a huge fan of odi grips but when you buy something that is suppose to fit and doesn’t fit makes me mad. Will these fit a '17 300xcw with motion pro throttle adapter and lectron carburetor? BEST ANSWER: yup they will slide ride on! This says it fits a wr250r. What cam do you use for the wr250r? BEST ANSWER: Cam A fits the WR250R/X. I also tried cam J, because that’s supposed to be for the R6 and gives a quick turn option, but sadly, the J cam did not clear the throttle housing. Will these fit on renthal twinwall 1 1/8" bars with no modifications? BEST ANSWER: Yes, BUT tight fit on the clutch side due to the handlebar knurling. Awesome grips! Yes. All handlebars are the same diameter where the grips install. 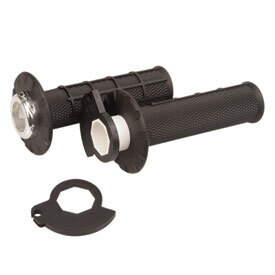 Will this cut through the throttle tube plastic on the ODI lockon grips? BEST ANSWER: This can if you hammer it hard enough but i would recommend using something else, as there is a chance of shattering the throttle tube. Will these fit a 2016 KTM 300 xcw? If so, which supplied throttle cam goes with it? BEST ANSWER: Yes it should fit. Fits my KTM 250 Xc perfect. Easy to install unless you have bark busters like I do. I had to drill out ends but they haven't moved since I put them on and are awesome all around. As for the throttle cam I believe it comes with 2 sizes so just match it up to your current one. Be sure and order 2 stroke model. Then just match up the cam to what you have and you should be good. I have used 4 stroke and 2 stroke grips. I love them. Does this grip set come with the E cam? First of all what is what you call E can?. The grips are just plain perfect. The best fix for all grips and easy to install on the fly. I love the grip and confort. Whats the best way to cut the ends to accommodate bark busters? BEST ANSWER: Here is the best way to open the end of your Lock-On Grips: The end of the grips were designed to be knocked out with ease. On end of the grip take a razor blade and cut along the lip of inside of the raised edge. We perforated the plastic to allow for this. Once you cut through the rubber, continue making a few more passes through the plastic. Once you have successfully cut through, take your grip and slide it onto the throttle side of your handlebars to pop out the ends. Hope this info helped out. Let us know if you have any further questions. If you look at the end of the grips there is a mark in the middle also I believe there is a pilot hole already in the plastic, drill the hole just big enough to expose the hole in your bars. I installed the plugs that you tap your bars and screw in the threaded insert, way better. 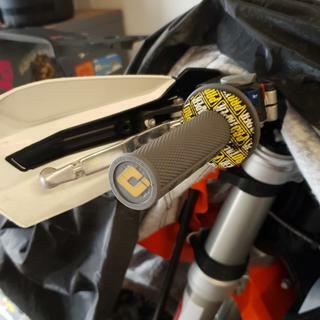 On the throttle side find a washer that’s fit inside the hole in the grip and don’t rub the throttle tube to space out the bark buster this is so the bark buster don’t interfere with the throttle and also if you fall on that side it won’t smash the bark buster into throttle and jam it up. Anyone put these on a yz 85? BEST ANSWER: Hi, Yes these will grips will work on a YZ85 with the addition of Cam "F" which is offered thru RMATVMC part number: H70SCF as a separate item. Will these grips fit a 04 Kawasaki KDX 200? What cam is necessary and is it included? BEST ANSWER: Yes, this will fit your machine. You will need to enter in your make, model, and year in the drop down boxes above the product image. These include the model specific cams required for installation. 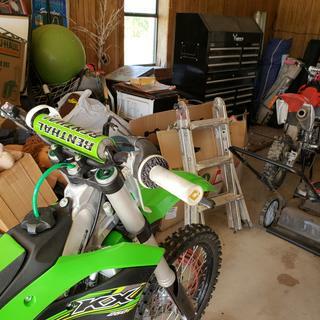 Is there a cam for an 09 kx 65? Protaper lock on don’t work. BEST ANSWER: Yes, Cam "L" will work with your application. Part # is H70SCL which you will find on the RMATV Site. Which cam for 2006 Yamaha ttr 230? BEST ANSWER: We do not have one that will fit the TTR230. Will these fit a 2002 yz 85?